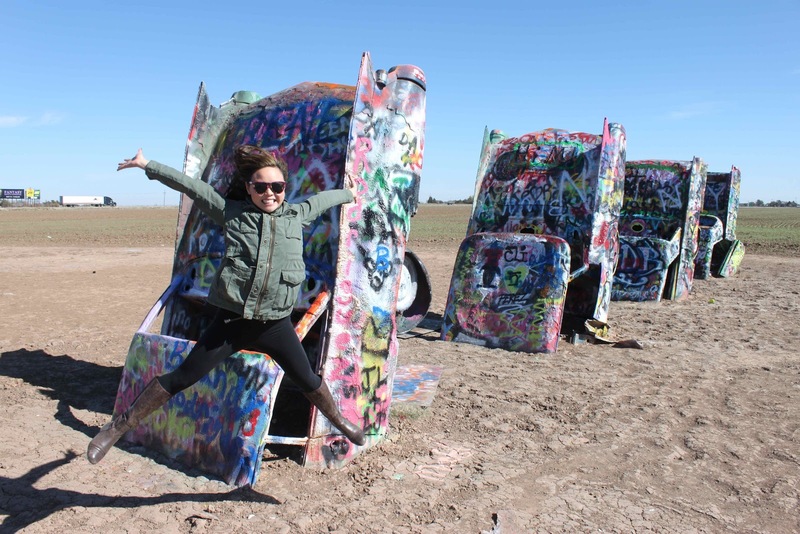 The Hip & Urban Girl's Guide: On The Road Again - A Route 66 Road Trip Update! On The Road Again - A Route 66 Road Trip Update! We've been driving across the country from Toronto to LA on Route 66 and here are a few of our latest photos! After rolling non-stop through the night towards Oklahoma City, we spotted a 66-foot LED pop bottle like a beacon in the middle of nothingness. 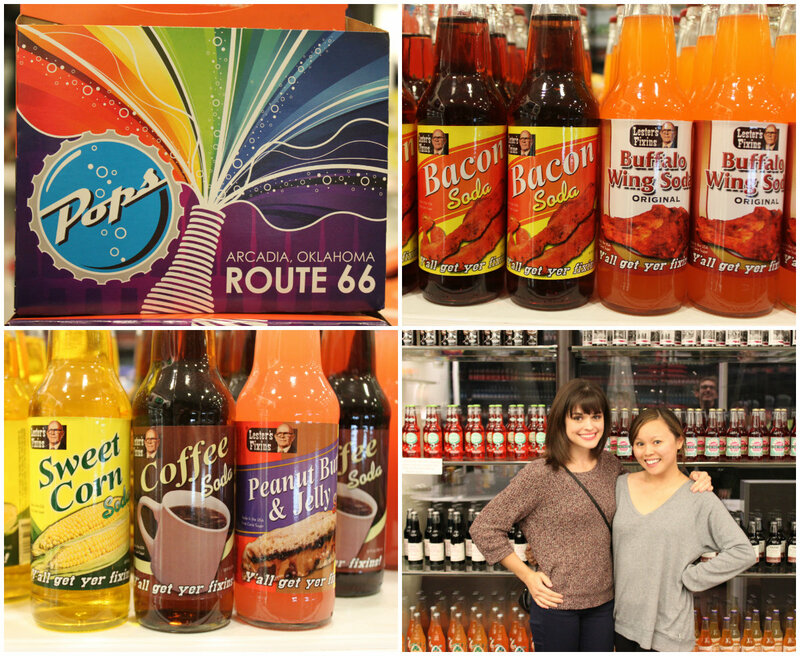 Pops on Route 66 is a gas station, diner and convenience store all rolled into one, except they carry 600 different types of pop inside their modern soda ranch! We met up with my friend Alyssa who showed us the ropes. Buy any pop, bring it into the diner and they'll make it into a milkshake for you! I took a pass on the sweet corn and bacon soda and opted for a gourmet cream soda. They carry brands from all over the country and even imports from overseas. Next up, Texas! We pulled over when we spotted this Route 66 landmark. 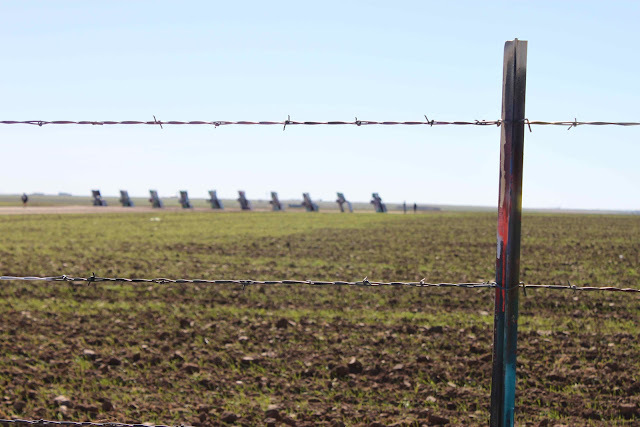 The Cadillac Ranch is located just west of Amarillo, Texas and you can spot this off the main highway - 10 Cadillacs all stuck into the ground in a row. 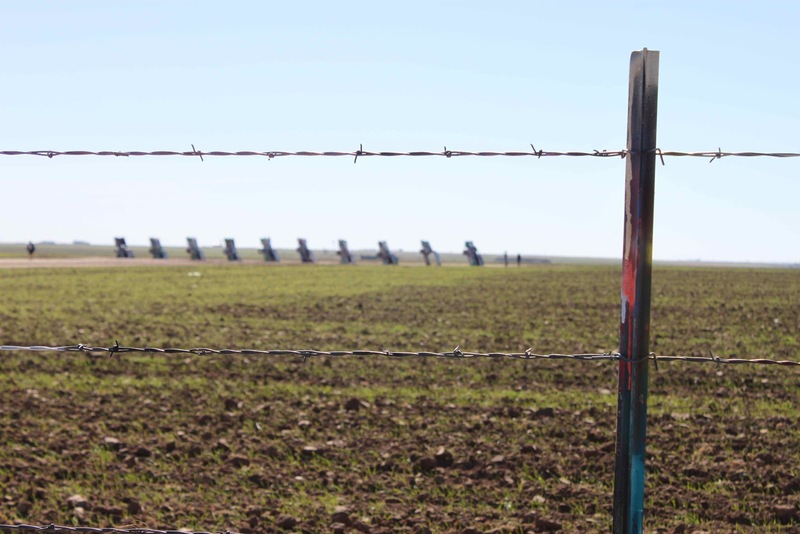 It's a pretty random thing to see in the middle of a farmer's field in the middle of Texas. I turned to my husband Paul and said, "Can you believe I dragged you all the way to Texas and now we're in the middle of a field staring at a bunch of Cadillacs?" He replied, "I'm not sure how you convince me into these crazy things - but here we are." It was sort of a surreal moment when we realized how far we've driven and what the hell we were actually doing. An old Route 66 museum with more classic cars, retro gas pumps and an old toy train relic. 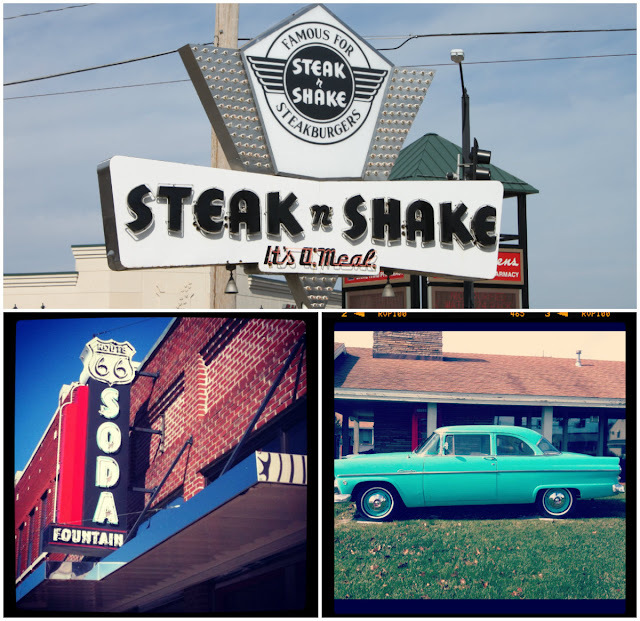 More fun retro signage we saw along the way - including one of the original Steak n Shake locations in Springfield, Missouri which still offer drive-in car service! The old car was parked in front of our Best Western Route 66 Rail Haven motel, where Elvis stayed in 1956. A stop in Amarillo, Texas brought us to The Big Texan Steak Ranch, home of the FREE 72 oz steak - as long as you can eat it in under one hour! Why? Because everything is BIG in Texas, that's why. This famous steakhouse has also been featured on Man vs. Food and if you choose to do the challenge, you are sat up on a stage at a table for four under a spotlight and clock. Check out all the amazing kitschy decor and my plate of steak with all the fixin's (above). I opted for only an 8 oz steak with macaroni & cheese, mashed potatoes, sauteed onions and mushrooms - all for under $20! The steak was perfectly cooked and delicious too. So even though it may look a little touristy on the outside, I can vouch for the food and you'll be sooo tempted after seeing all the billboards along the highway. Know anyone that could eat a 72 oz steak in one hour? We'll be posting more fun updates from our Route 66 Road Trip next week!